Low-carb eating is becoming increasingly common, with diets like Whole30 and the ketogenic diet gaining widespread popularity. And, pasta is at the top of the high-carb list food list. Luckily, Instant Pot Spaghetti Squash is a fantastic pasta substitute! It’s easy to cook and is gluten-free, much lower in carbs and calories, and full of healthy nutrients for your diet. Once cooked, it is easy to scrape into spaghetti-like strands that have nearly the same texture, flavor, and color of spaghetti. 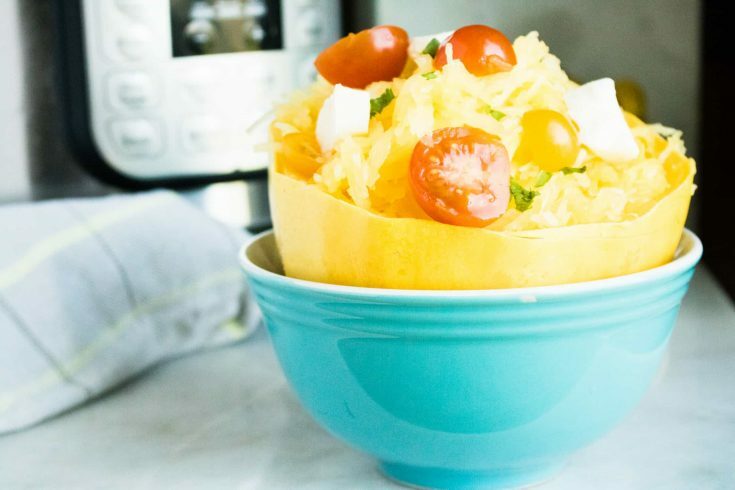 Swapping traditional noodles with Instant Pot Spaghetti Squash is the perfect compromise for those wanting to indulge their pasta cravings, but who are keeping an eye on what they are eating. And, thanks to the wonder that is the Instant Pot, this recipe is so simple and easy to follow. Plus, it’s ready in just 10 minutes! Does Spaghetti Squash Taste Like Spaghetti? I’m not going to lie to you, spaghetti squash does not taste just like spaghetti. The texture is similar to spaghetti noodles, but the taste is not. The flavor has a very mild undertone of squash but it is not overwhelming, and the flavor is not as pronounced as eating a yellow squash. But because these noodles have a mild flavor note, it makes them the perfect base for any sauce! Try them with this Basil Pesto from Scratch! How Many Cups of Noodles Does A Cooked Spaghetti Squash Make? 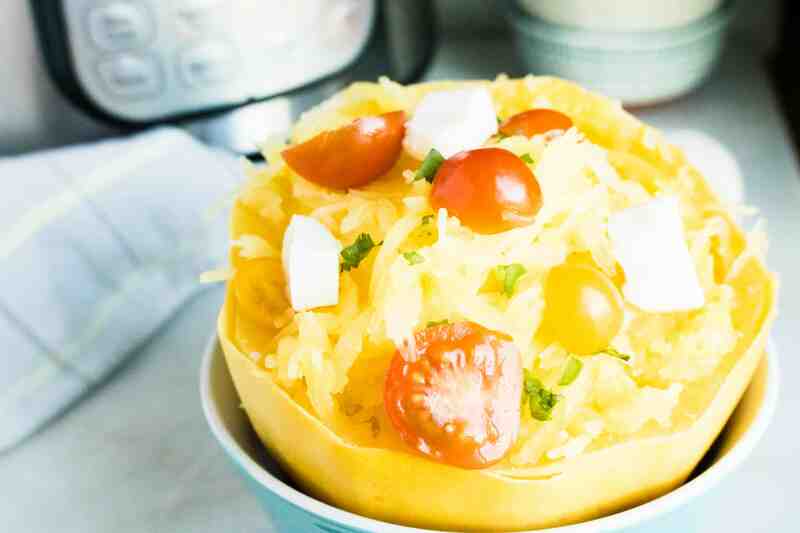 A medium sized spaghetti squash, about 2 pounds, will yield 2-3 cups of cooked noodles. 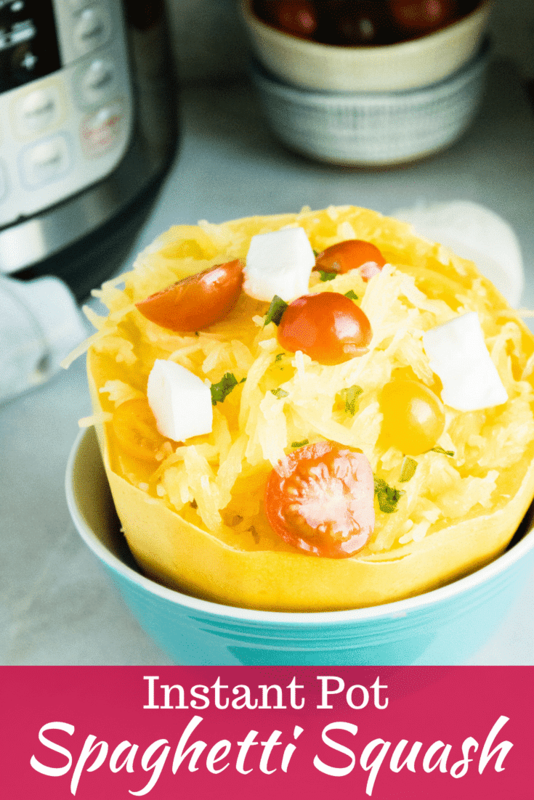 Are Spaghetti Squash Noodles Healthier Then Traditional Pasta Noodles? Absolutely!! One serving of traditional spaghetti noodles has 200 calories, 1 gram of fat and 42 grams of carbs. While that same serving of spaghetti squash noodles has just 50 calories, less than 1 gram of fat, and 12.5 grams of carbs. Can Cooked Spaghetti Squash Be Stored and Eaten Later? Yes! You can place the leftover noodles in the fridge or freeze them to eat at a later time. Cooked spaghetti squash will keep for 3-5 days in the fridge, and up to 6 months in the freezer. Step #1: Cut the squash in half. 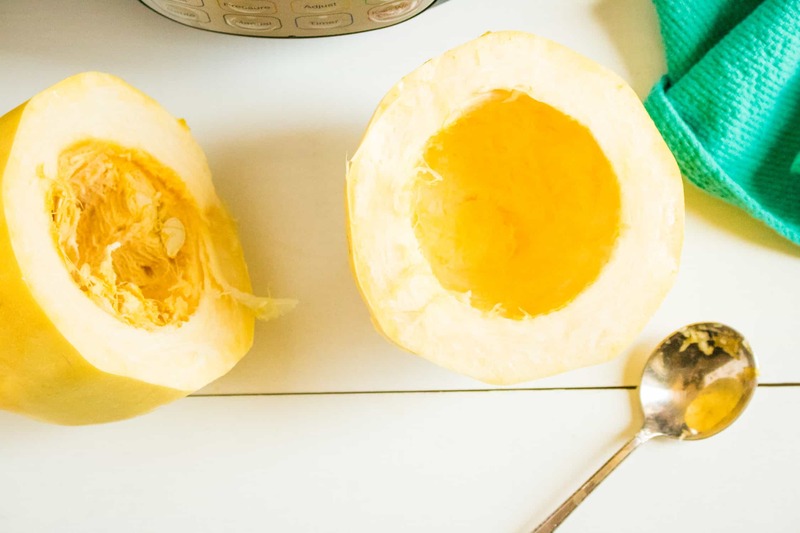 Scoop out seeds and membranes from inside the squash. Step #2: Add water to the Instant Pot and place the trivet in the pot. Put the spaghetti squash on top of the trivet. Step #3: Close the Instant Pot lid and turn the valve to sealing. Step #4: Set manual pressure time of 7 minutes. Do a quick pressure release. Step #5: Remove the squash from the pot and scoop squash ‘noodles’ out, or eat straight from the squash skin. Enjoy! 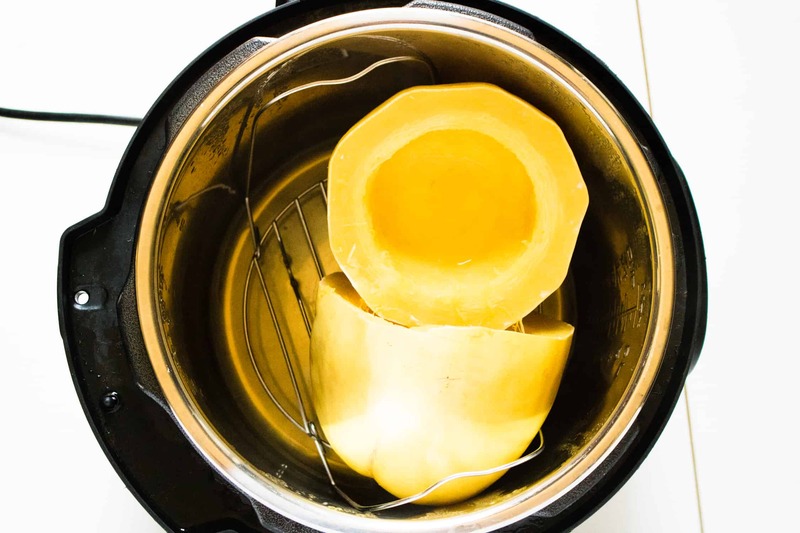 Instant Pot Spaghetti Squash perfectly replaces traditional noodles, so you can enjoy low-carb and low-calorie versions of your favorite pasta dishes! Cut the squash in half. Scoop out seeds and membranes from inside the squash. Add water to the Instant Pot and place the trivet in the pot. Put the spaghetti squash on top of the trivet. Close the Instant Pot lid and turn the valve to sealing. Set manual pressure time of 7 minutes. Do a quick pressure release. Remove the squash from the pot and scoop squash ‘noodles’ out, or eat straight from the squash skin.